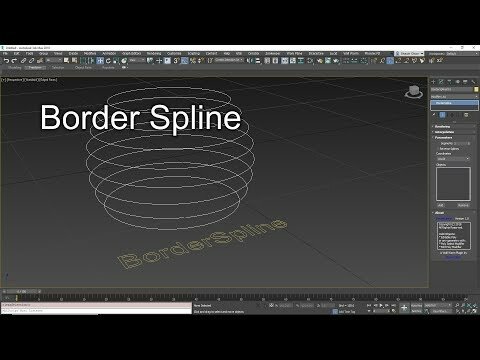 Border Spline is a custom shape primitive that will generate splines along the borders of Editable Poly objects. If you use Wall Worm Model Tools or Wall Worm Pro, you should update your version of that software to get Border Spline as it is now included in those programs. Use the steps below if you do not use those programs. Copy the file BorderSpline.ms into your scripts/startup folder. After installation and restarting Max, there will be a Border Spline shape in the Shapes section of the Create Tab. If you find a bug, please post them in the Wall Worm forums at www.wallworm.net . Please share the Border Spline link on Facebook, Twitter, Google+ and any Design Forums you participate on. Setting the Segments to a high value can cause the script to run very slowly. Using this spline with high-poly meshes may cause the script to run very slowly. The Interpolation rollout does not do anything. It is auto-generated by Max but not used in scripted splines.